Coolpad, a Chinese smartphone manufacturing company will be launching a new brand new smartphone in the Indian market which is believed to be ultra-cheap handset. The company will be adding a new budget friendly smartphone to its Cool-Series in the Coolpad portfolio. The smartphone maker will be officially revealing the new smartphone in India tomorrow. Moreover, the company has been teasing the smartphone for quite some time now for building the anticipation among the Indian buyers. Oppo Find Z Will Be Oppo’s Next Flagship Smartphone; To Be Powered By Snapdragon 855 Chip. A series of teasers of Cool 3 smartphone already gave some major insights about the device. 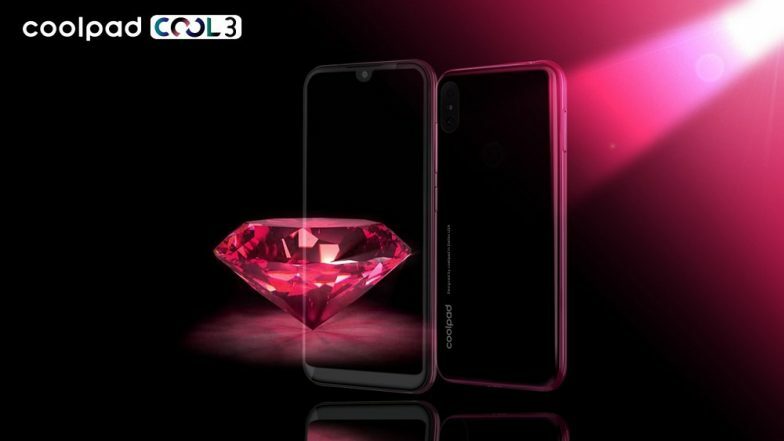 The company has already confirmed that Cool 3 smartphone will be the first device to feature waterdrop display, which we have already seen on several smartphones from other OEMs. The new handset from Coolpad will run on the latest version of Android 9 Pie OS out of the box. Featuring a glossy back finish with a gradient design, the smartphone is expected to be priced under Rs 6000. The company is also emphasising the design aspect of the smartphone, which is claimed to be derived by the Coolpad design team in Dallas. Oppo K1 Smartphone With 25MP Selfie Camera To Be Launched in India on February 6, 2019. Moreover, the teaser images of the forthcoming smartphone clearly shows thick bezels at the bottom, however, will carry hugely trimmed bezels on the sides as well as top. At the back, the smartphone is expected to sport vertical aligned dual cameras with LED flash in between two sensors. However, other features and specifications of the smartphone are yet to be announced. As far as Coolpad as a company is concerned, the phone maker has been on and off in the media spotlight. However, the company is now looking to take on the challenges from the other OEMs in the market. Currently, the race to make better handsets at an affordable price point has become very intense and Coolpad might just attract the masses.